Over the past three decades, governments have cut their financial support to post-secondary education. In turn, universities have opened the door wide open to the money – and influence – of corporations and wealthy donors. 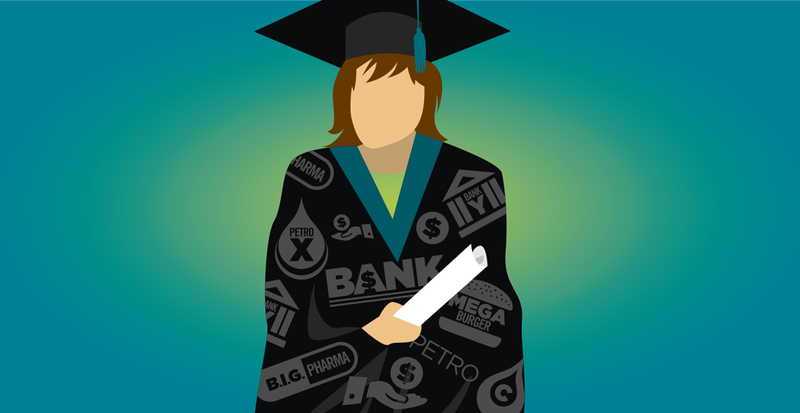 CUPE has produced a backgrounder that looks at the increasingly corporatized post-secondary sector. As universities and colleges have seen government funding decline, they have increasingly turned to other sources of funding, and many of these donations have conditions attached. In some cases, donors are even given control over staffing decisions, curriculum, and research agendas relating to their donation. Most big donors direct their funds toward a specific cause, such as the creation of a new program, a research fund, a new facility, a research chair, or scholarships for a certain program. These causes tend to be heavily focused in certain areas – business programs, medical schools, and other “prestige” institutions. Donations are not the only source of private money. Post-secondary institutions are also signing contracts, partnership arrangements and sponsorship deals with corporations. Much like donations, this ends up directing institutional priorities. In many cases, corporate sponsorships and contracts have put universities into clear or perceived conflicts of interest. Instead of conducting research that is in the public interest, the public ends up subsidizing research in the corporate interest. It should come as no surprise that we are also seeing an increasingly corporate mindset in university and college administrations, beginning with rapid growth in the number of administrators and their compensation. The increasing corporate mentality among administrators has contributed to more privatization and contracting out by universities and colleges. In some cases, entire services – such as food services – will be contracted out by an institution, to an employer who pays low wages and provides few-to-no benefits. Private money and corporate-style management end up compromising the provision of publicly funded education in Canada. That’s why we need the federal government to reinvest in post-secondary education and to adopt a Post-Secondary Education Act that puts clear limits on the kind of control that private donors and corporations can exercise over universities and colleges.